What Areas of the Body Does a Treadmill Work? Claire Lunardoni has written for LIVESTRONG.COM and eHow since 2009. She is an American College of Sports Medicine-certified personal trainer and a fitness instructor who trains endurance athletes for IntEnd: Integrated Endurance in San Francisco. She holds a Bachelor of Arts in language studies from University of California in Santa Cruz. 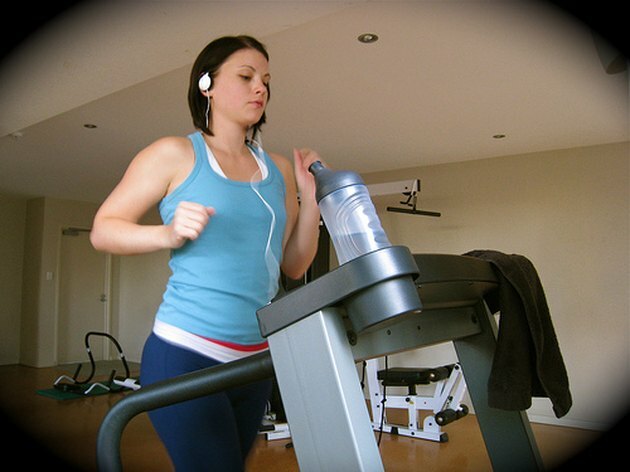 Treadmills offer one of the best cardiovascular workouts because they work your whole body. They offer a freedom of movement that engages muscles throughout your body, toning muscle as you burn calories. Your hamstrings (back of thighs) and quadriceps (front of thighs) do most of the work in running and walking. Raising the incline on the treadmill increases the load on your hamstrings and glutes (backside). Your gluteal muscles work in concert with your hamstrings to provide propulsion when you are running. The muscles in your hips lift your knee off the belt with each step. The muscles in the backs of your calves (gastrocnemius and soleus) engage with each step. Running and walking also work the muscles in the front of the shins (tibialis anterior). Between the rib cage and the hips, there is little bone to hold you upright. Instead, the “core” muscles hold you erect while running or walking. The core muscles also act as a conduit for transferring power between the upper and lower body, allowing pumping arms to power you up an incline. Your biceps and chest (pectorals) pump your arms as you walk or run. Video: "Muscles Used in Running"